Python's super() is one of those aspects of the language that many developers use without really understanding what it does or how it works. To many people, super() is simply how you access your base-class's implementation of a method. And while this is true, it's far from the full story. In this series I want to look at the mechanics and some of the theory behind super(). I want to show that, far from just letting you access your base-class, Python's super() is the key to some interesting and elegant design options that promote composability, separation of concerns, and long-term maintainability. In this first article I'll introduce a small set of classes, and in these classes we'll find a bit of a mystery. In subsequent articles we'll investigate this mystery by seeing how Python's super() really works, looking at topics like method resolution order, the C3 algorithm, and proxy objects. In the end, you'll find that super() is both more complex than you probably expected, yet also surprisingly elegant and easy-to-understand. This improved understanding of super() will help you understand and appreciate Python on at a deeper level, and it will give you new tools for developing your own Python code. This series is written using Python 3, and some of the examples and concepts don't apply completely to Python 2. In particular, this series assumes that classes are "new-style" classes. ((For a discussion of the difference between "old-style" and "new-style" classes, see the Python wiki.)) In Python 3 all classes are new-style, while in Python 2 you have to explicitly inherit from object to be a new-style class. SimpleList uses a standard list internally, and it provides a smaller, more limited API for interacting with the list data. This may not be a very realistic class from a practical point of view, but, as you'll see, it let's us explore some interesting aspects of inheritance relationships in Python. The initializer calls SimpleList's initializer and then immediately uses SimpleList.sort() to sort the contents. SortedList also overrides the add method on SimpleList to ensure that the list always remains sorted. In SortedList we already see a call to super(), and the intention of this code is pretty clear. In SortedList.add(), for example, super() is used to call SimpleList.add() - that is, deferring to the base-class - before sorting the list contents. There's nothing mysterious going on...yet. You'll immediately notice that IntList is structurally similar to SortedList. It provides its own initializer and, like SortedList, overrides the add() method to perform extra checks. In this case, IntList calls its _validate() method on every item that goes into the list. _validate() uses isinstance() to check the type of the candidates, and if a candidate is not an instance of int, _validate() raises a TypeError. TypeError: SortedIntList only supports integer values. You should spend some time playing with SortedIntList to convince yourself that it works as expected. You can get the code here. It may not be immediately apparent how all of this works, though. 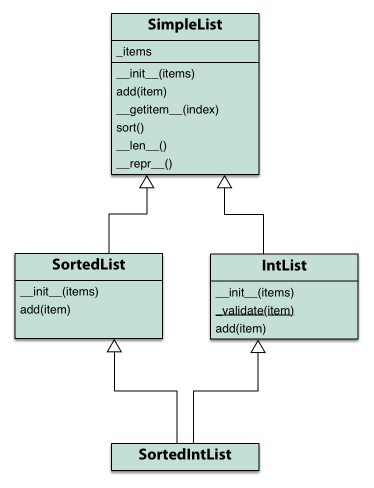 After all, both IntList and SortedList define add(). How does Python know which add() to call? More importantly, since both the sorting and type constraints are being enforced by SortedIntList, how does Python seem to know to call both of them? This is the mystery that this series will unravel, and the answers to these questions have to do with the method resolution order we mentioned earlier, along with the details of how super() really works. So stay tuned! If you do know how it works, then congratulations! This series probably isn't for you. But believe me, lots of people don't. For a detailed look at the differences between the language versions, see Guido's list of differences. You probably already know how to use Python's super() to call base-class implementations of methods. But do you really know what it's doing? The details of super() are elegant, interesting, and powerful, and while super() is probably more complex than you expect, it's also surprisingly easy to understand. In this series we'll explore super() by first uncovering a bit of a mystery. To resolve the mystery, we'll look a bit under Python's hood to see how super() really works. In this series we look in detail at the behaviour of one of the simplest geometric functions, demonstrate its flawed behaviour when implemented with floating point numbers, and fix it using an exact number type provided in the Python Standard Library. Computational geometry - a world where lines have zero thickness, circles are perfectly round and points are dimensionless. Creating robust geometric algorithms using finite precision number types such as float is fiendishly difficult because it's not possible to exactly represent numbers such as one-third, which rather gets in the way of performing seemingly simple operations like dividing a line into exactly three equal segments. In this short series of posts, we'll look at some of the pitfalls of geometric computation, with examples in Python, although the key messages are true with finite-precision floating point numbers in any language. Rational numbers, modelled by Python's Fraction  type can be useful for implementing robust geometric algorithms. These algorithms are often deeply elegant and surprising because they must avoid any detour into the realm of irrational numbers which cannot be represented in finite precision, which means that using seemingly innocuous operations like square root, for example to determine the length of a line using Pythagoras, are not permitted. One algorithm which benefits from rational numbers is a simple collinearity test determining whether three points lie on the same line. This can be further refined to consider whether a query point \(p\) is above, exactly on, or below the line. Now there are many ways to approach writing such a function, and like many questions in computational geometry the naïve approaches are either overly complex, inefficient, or just plain wrong, albeit in subtle ways. I won't cover the story of how to arrive at a robust algorithm, that story is entertaining covered in Writing Programs for "The Book" by Brian Hayes. Rather, we'll start where Brian leaves off by showing how to implement the algorithm in Python using both floating-point and exact arithmetic so we can understand the tradeoffs between performance and correctness inherent in these choices. Along the way, we'll perhaps touch on some aspects of Python which may be new to you. Whether p is above, exactly on, or below line p, r can be determined from the orientation of triangle p, q, r.
The function \(o\) returns \(+1\) if the polyline \(p\), \(q\), \(r\) executes a left turn and the loop is counterclockwise, \(0\) if the polyline is straight, or \(-1\) if the polyline executes a right turn and the loop is clockwise. These values can in turn be interpreted in terms of whether the query point \(p\) is above, on, or below the line through \(q\) and \(r\). What's happening here is that we've run into problems with the finite precision of Python floats at points very close the diagonal line, and the mathematical assumptions we make in our formula about how numbers work break down due to the fact that floating point numbers are a far from a perfect model of real numbers. Next time, we'll investigate more thoroughly, the behaviour of this orientation test at the limits of floating-point precision. The Fraction type which models rational numbers is defined in the Python Standard Library fractions module. Hayes, Brian. (2007) Writing Programs for "The Book". In: Oram, A. & Wilson, G., eds. Beautiful Code O'Reilly Media. pp. 539–551. In C we could use the nextafter() function to generate the next representable floating point number. Unfortunately, nextafter() is not exposed to Python. Various workarounds are available, including a version built into Numpy, directly calling the C version using ctypes and a pure Python implementation. As a way to learn about Swift I've been trying to write a simple game using Sprite Kit. My initial plan was to just allow a ball to be dragged around the screen and ensure it was constrained by the screen edges. This was a little harder than originally envisioned. This was partly because the default Game project generated by Xcode 6 is slightly different to that generated by Xcode 5 and so none of the existing Sprite Kit tutorials referred to this area. My main issue was that I could move the ball around and when the drag finished the ball was endowed with velocity so it travelled after release and despite writing some simple code to ensure if the additional travel would take it off the screen this would bound it. Where ball is a member variable of the class containing this method that is an instance of SKSpriteNode. Despite this the ball kept disappearing. 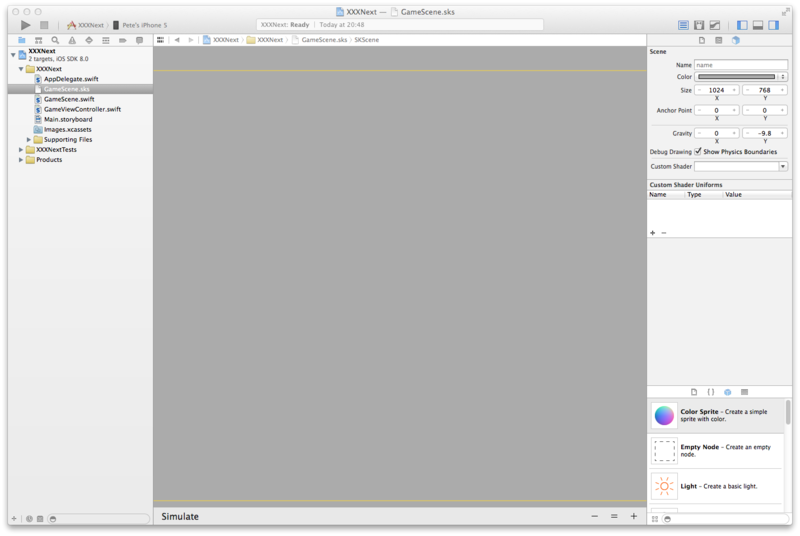 Reading various online articles, tutorials & StackOverflow posts there seemed to be an issue with Sprite Kit projects always starting up in landscape mode. When I added some debug to this statement (& else where), i.e. You can see that the default scene size is 1024x768, i.e. iPad in landscape mode. Changing this to 320x576 (for iPhone 4 inch) fixes the problem. NOTE: When making this change make sure you explicitly save the changes. Just modifying the values and building/running the project often seems to result in them being reset. I make sure I navigate away from the Size boxes before pressing Cmd-S.
Of course this is inflexible as it doesn't size to device. As I'd like my app to run on multiple device types I'm probably better of following the Xcode 5 generated code or perhaps just adding re-sizing code once the Scene has been loaded from the SKS file; as I'm not sure what else that gives me. Anyway, this difference in the generated starter apps is something to be aware of & the fact that the initial landscape startup issue reported against Xcode 5 seems to be present though possibly in a different guise. Certainty in the generated app from Xcode 5 it all works fine for me. When I added logging code to display the View and Scene size they were both reported as 320x568. 1. The post below applies to Xcode 6 Beta 2. With Beta 3 & 4 the relationships between the Swift and Objective-C regarding the calling of super class initializers has been formalized. 1b. When calling an Objective-C any initializer can be called but unlike what happened in Beta 2 if the initializer invoked is not the Objective-C 'designated' initializer and thus calls it this DOES NOT now result in a virtual like call to an initializer with that signature in the subclass, i.e. the main problem that led to the writing of this blog post. 2. If you want to subclass an SKSpriteNote in Beta 4 the following StackOverflow post shows how. 3. It seems that for some OS classes, in my case SpriteKit either Apple directly or some Xcode magic now provides a shim Swift wrapper of the Objective-C interface (the one for SKSpriteNode has a comment with a date of 2011 but when attempting to "show in Finder" nothing happens). As such all the initializers for SKSpriteNode are marked as convenience except for the 'designated' initializer, e.g. Initialize a sprite with a color and the specified bounds. @param color the color to use for tinting the sprite. Therefore from a derived class it's impossible to use the super class convenience methods which is what Swift demands but is a shame as it often means re-implementing similar code in the derived class, as per the StackOverflow link. It's not perfect by any means but it's a lot more consistent than Beta 2. I don't (yet) understand where the magic shim comes from and this is update is based on Beta 4 whereas of writing Beta 5 has just been released! Ok, same process add that one to the Ball class. That time it worked but I was puzzled as to why. What seems to be happening is that the derived class is calling the non-designated initializer in the super class which is then calling the designated (or another non-designated one in between). However, when this initializer is called rather than calling the super class implementation it calls one in the derived class, whether it exists or not. In the case of Ball they didn't hence the error. Unlike subclasses in Objective-C, Swift subclasses do not not inherit their superclass initializers by default. Swift’s approach prevents a situation in which a simple initializer from a superclass is automatically inherited by a more specialized subclass and is used to create a new instance of the subclass that is not fully or correctly initialized. If you want your custom subclass to present one or more of the same initializers as its superclass—perhaps to perform some customization during initialization—you can provide an overriding implementation of the same initializer within your custom subclass. This explains it. Basically, in Swift, initialization methods work like virtual functions in fact super virtual functions. If a super class initializer is invoked and that in turns calls another initializer (designated or not) then it forwards the call to the derived class. The upshot of this seems to be that for any derived class in Swift it would need to re-implement all of the super classes initializers or at least any which may be invoked from the the other initializers. Designated initializer for 'Foo' cannot delegate (with 'self.init'); did you mean this to be a convenience initializer? Whereas in Objective-C the designated initializer is effectively advisory, in Swift it's enforced. If a initializer isn't marked with the convenience keyword then it seems (at least during compilation) all initializers are treated as being the designated initializor and not at the same time. In this case the compilation failed as there was no designated initializer for Bar.init to call and as Foo.init(value value:Int) wasn't marked as a connivence initializer it was assumed to the designated one and is thus forbidden from calling another initializer in its own class; somewhat paradoxically. It also completely bypasses the convenience method of the superclass rendering it useless for calling from a derived class. As for explaining the original problem this doesn't help either as the new rules prevent the problem. Herein lies the clue though. It suggests the problem is not with Swift classes subclassing other Swift classes but when a Swift class subclasses an Objective-C class. This differs from the previous version as the connivence initializer now calls the designated one within Baz meaning the -(id)initWithValue:(NSInteger) value is never called which is why the second value is nolonger 2. Whilst this explains the behaviour I was seeing when subclassing SKSpriteNode and by providing a mirror of its initializers without marking any as convenience it solves the problem of using the convenient init(imageNamed name: string) method it doesn't do so particularly elegantly nor in a fully Swift style; as it leaves the class with a set of initializers none of which are marked convenience. A designated initializer could be specified by marking all but the init(texture texture: SKTexture!, color color: UIColor!, size size: CGSize) method as convenience and having them cross call this one. However this would prevent the direct calling of init(imageNamed name: string) which is a lot more convenient than the other methods. Ironically, whilst Swift formalizes the designated initializer concept and it looks like it will work well for pure Swift code it can be somewhat inconvenient when subclassing Objective-C classes. P.S. For those of us who have trouble spelling the keyword convenience is far from convenient. A keywoard to mark the designated initializer may well have been more convenient and probably easier to spell! As the chair for the C++ track on NDC Oslo, I am happy to report that the C++ track was a huge and massive success! The C++ community in Norway is rather small so even if NDC is a big annual conference for programmers (~1600 geeks) and even with names like Nico, Scott and Andrei as headliners for the track, I was not sure how many people would actually turn up for the C++ talks. I was positively surprised. The first three sessions was packed with people (it was of course a cheap trick to make the three first sessions general/introductory on popular topics). All the other talks were also well attended. The NDC organizers have already confirmed that they want to do this next year as well. NDC Oslo is an annual five day event. First two days of pre-conference workshops (Andrei did 2 days of Scalable design and implementation using C++) and then 9 tracks of talks for three full days. As usual, NDC records all the talks and generously share all the videos with the world (there are 150+ talks, kudos to NDC!). I have listed the videos from the C++ track this year. I will also put out a link to the slides when I get them. Enjoy! With this great lineup I hope that NDC Oslo in June has established itself as a significant annual C++ event in Europe together with Meeting C++ Berlin in December and ACCU Bristol in April. Save the date for NDC next year, June 15-19, 2015. I can already promise you a really strong C++ track at NDC Oslo 2015. A final note: Make sure you stay tuned on isocpp.org for global news about C++.